It seems that we are witnessing the death of our planet right before our very eyes. The extreme weather, Gulf oil disaster and use of deadly dispersants, to decades of agrichemical and synthetic medicines leeching into water ways, and general human pollution resulting in having to now map the North Atlantic Garbage Patch (not to be confused with the Great Pacific Garbage Patch ) -- has resulted in major breaches to our interdependent life system. Scientists have gathered data from 22 years of surface net tows to map the North Atlantic garbage patch , which lies to the east of Bermuda, and its change over time, creating the most accurate picture yet of any pelagic plastic patch on earth. The data were gathered by thousands of undergraduates aboard the Sea Education Association (SEA) sailing semester, who hand-picked, counted and measured more than 64,000 pieces of plastic from 6,000 net tows between 1986 to 2008. The Great Pacific Garbage Patch, also described as the Pacific Trash Vortex, is a gyre of marine litter in the central North Pacific Ocean the size of France. Recent data collected from Pacific albatross populations suggest there may be two distinct zones of concentrated debris in the Pacific. he Patch is characterized by exceptionally high concentrations of pelagic plastics, chemical sludge, and other debris that have been trapped by the currents of the North Pacific Gyre. the Great Pacific Garbage Patch is not a solid mass, as is sometimes imagined, but a kind of marine soup whose main ingredient is floating plastic debris. It was discovered in 1997 by a Californian sailor, surfer, volunteer environmentalist and early-retired furniture restorer named Charles Moore, who was heading home with his crew from a sailing race in Hawaii. Several major sea currents also converge in the gyre and bring with them most of the flotsam from the Pacific coasts of Southeast Asia, North America, Canada and Mexico. Fifty years ago nearly all that flotsam was biodegradable. These days it is 90 per cent plastic. Over the past few years, honeybees have suddenly and inexplicably disappeared from colonies that once thrived across the northern parts of the American and European continents. The pest, a type of mite called Varroa destructor, is a natural parasite of the Eastern honeybee (Apis cerana). Today it is almost impossible to find a honeybee colony free from the mite. "The landscape has changed considerably over the last 30-40 years; we've seen well-documented changes in our birds, our flora and also in some of our insects," said Andrew Watkinson of the Insect Pollinators Initiative (IPI), "but now there's a growing concern that our insect pollinators are also in decline, whether that's in terms of the number of honeybees, number of bumblebee species, butterflies and hoverflies." Editorial comment: Can the criminality of the 'free market' 'growthists' be under dispute any more? 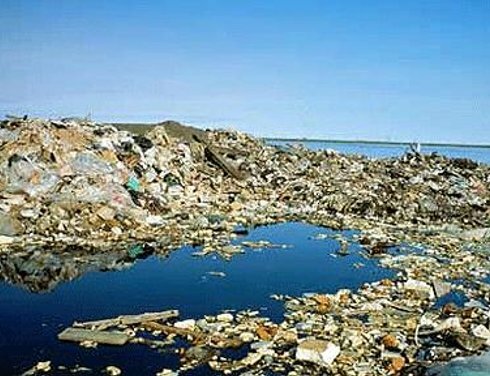 Australia has undoubtedly contributed to the piles of garbage now floating in our oceans by its massive past exports of coal, gas, metals and other raw materials to China, India, Japan and other economies which are so wastefully churning out those plastics. Yet our political, economic and industrial 'leaders' want this country to further compound the problem by massively expanding our exports and in doing so turning much our country, including agricultural land and nature reserves, into a desolate, poisoned quarry. To make this possible, we are told that we must massively import more workers to dig up our raw materal. Of course, by their privatisation of the Port of Brisbane and Queensland's railways, the Queensland Government will ensure that little of the proceeds of this global environmental vandalism will go into the pockets of ordinary Australians. Instead it will help to further line the pockets of the already obscenely rich.